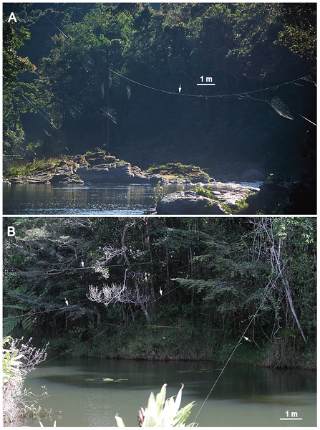 I'm Curious Too: How Does A Spider Build Its Web Over A River? I was walking back from lunch one day when I saw something amazing: a spider web, a HUGE spider web which spanned across a small water channel roughly two meters wide. And nestled in the center of the web was a spider about the size of my thumb. If that's not amazing, I don't know what is. How could a spider the size of my thumb travel across the two-meter wide trench to build the web? The first thing that came into my mind was that the spider might be a jumping spider, a family of spider that is well known for its ability to jump over large distances (by some account, up to 50 times their body length). However, the spider that I saw was only around 2 cm long, which makes the furthest distance it can travel to be around 100 cm—only half the width of the trench. Moreover, other spiders, for instance spiders from the Caerostris genus can also build enormous, mind-boggling webs which sometimes span across rivers. It turns out that the question had already been answered by Gregoric et al. in a paper published in PLoS One in 2011. The research team from the University of Puerto Rico in the United States traveled to Madagascar to observe the Darwin's bark spider (Caerostis darwini), filmed 90 web-building events and compared its web-building behaviors to other species of orb-web spiders. Darwin's bark spider was discovered in 2009 by Kuntner and Agnarsson. The species is endemic to Madagascar and is unique in building giant webs across streams, rivers and lakes. With its huge web, you would be forgiven to thinking that the inhabitant is at least as large as the palm of your hand, but the male C. darwini is generally around 6 mm long while the female is only about 20 mm long. The web of this species is made of incredibly strong silk—so strong that it outperforms all other known spider silks, or even most synthetic fibers. Even more amazingly, Darwin's bark spiders' webs are suspended on bridge lines—the main silk that connects two objects to enable the rest of the web to suspend below it--that often exceed 10 meters, or sometimes up to 25 meters in length—large enough to wrap around a Volkswagon Beetle. Gregoric and his team observed that the spiders would first release a large amount of bridging silk into the air, which is then carried downwind across the water body. If the other end of the bridging silk became entangled in vegetation, the spiders started reeling in the silk to increase its tension. If the attachment broke, the spiders reeled in the loose silk and consumed it, and restarted the process. If the attachment held, then the spiders have a bridge line. The spiders then proceeded to build the rest of the web. Here's a helpful animation that shows the process of building a large web.